However, unknown to most people is the fact that only the original Emerald Tablet contained all of Thoth Hermes Trismegistus’ wisdom from which the spiritual art of alchemy was born and nurtured in ancient Egypt. Thoth bestowed his Emerald Tablet to the Eye of Horus Mystery School that he founded. He taught certain Super Enlightened Mystery School teachers how to access the full wisdom of the Emerald Tablet he stored within that wondrous Teraphim. Ga Ra and Za Ra used ancient ben Panther family records to create their Attain Enlightenment recording where they explain some of Thoth’s vast amount of wisdom contained within his Emerald Tablet. Sumerian Hebrews invaded Egypt thousand of years ago and as recorded in the Old Testament when they returned home, they took with them the portable treasures of Egypt. In this way, the Emerald Tablet and all of Thoth Hermes Trismegistus’ priceless artifacts and documents were taken from Egypt and stored in the Sumerian Hebrew stronghold of Megiddo. Tired of Sumerian Hebrews breaking the peace treaty and attacking Egyptian border towns, the Egyptians under the Pharaoh Thoth Moses III retaliated and captured the Sumerian Hebrew stronghold of Megiddo. Thoth Moses III then returned to Egypt with Thoth Hermes Trismegistus’ priceless treasures and artifacts. Thoth Moses III had one copy made of the “outer text” and he kept the original Emerald Tablet and all of Thoth Hermes Trismegistus’ priceless treasures in a specially built container that would become known as the “Ark of the Covenant” in the Bible. But, his great grandson, “The Moses” in anger stole Egypt’s Ark of the Covenant and the original Emerald Tablet. In the 7th century, evil vicious Islamic religious zealots from Arabia invaded Egypt and stole Thoth Moses III’s copy of the Emerald Tablet. Then, after deliberately burning the Library of Alexandria to destroy historical and scientific documents that conflicted with the Koran, these evil ones sent the copy of the Emerald Table, and Egypt’s portable wealth, to Mecca. However, the original Emerald Tablet remained in the Ark of the Covenant and a thousand years ago, the Super Enlightened One called Quetzalcoatl found the Ark of the Covenant. Later, he had his Desposni relatives in the Knights Templar moved America’s and Europe’s portions of the Ark to France, and then to Scotland in the 14th century. Quetzalcoatl, with his wife White Buffalo Calf Woman took Africa’s portion of the Ark to Ethiopia. 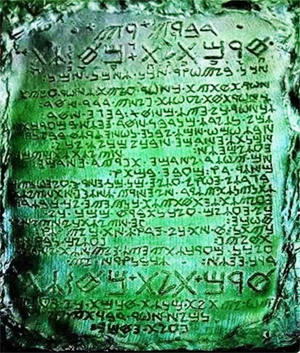 And so it is today, that some spiritual adepts say the original Emerald Tablet is with Thoth’s golden rod of levitation in Ethiopia, while others say it is in Scotland and a growing number of adepts say it is buried in upstate New York’s Egypt Valley. Here are two translations of the Emerald Tablet, one by Newton and one by a 12th century Desposni Knights Templar. A translation by Isaac Newton found among his alchemical papers that are currently housed in King’s College Library, Cambridge University. 4) The Sun is its father, the moon its mother, the wind hath carried it in its belly, the earth is its nurse. 6) Its force or power is entire if it be converted into earth. 7) Separate thou the earth from the fire, the subtle from the gross sweetly with great industry. 8) It ascends from the earth to the heaven & again it descends to the earth & receives the force of things superior & inferior. 10) & thereby all obscurity shall fly from you. 11) Its force is above all force. For it vanquishes every subtle thing & penetrates every solid thing. 12) So was the world created. 13) From this are & do come admirable adaptations whereof the means (or process) is here in this. 6) It is the father of all ‘works of wonder’ (Telesmi) in the world. 7a) it will separate earth from fire, the subtle from the gross. 12) From this comes marvellous adaptations of which this is the procedure.